We’d love your help. 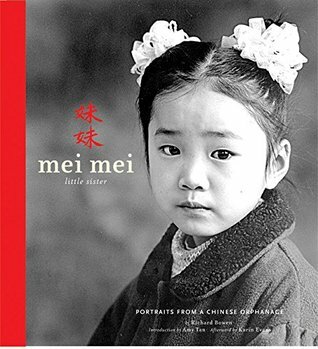 Let us know what’s wrong with this preview of Mei Mei?Little Sister by Richard Bowen. To ask other readers questions about Mei Mei?Little Sister, please sign up. Poignant and beautiful photographs of little children from a Chinese orphanage. Very lovely. This book is amazing. It is mostly a book of photos with a brief summary at the beginning. As I look at the photos of these little girls in the orphanage, I cannot help but wonder if they will ever know how very special they are. It breaks my heart to see their little faces, some with smiles, many with without. Beautiful portraits taken from several Chinese orphanages of the little girls who have been discarded because of China's stringent single child policy. Very compassionately done-author/photographer adopted two of the little girls. Love the images in this book...they are sad, haunting and beautiful. I have a special connection, too. My daughter is in one of the small shots taken in her SWI, illustrating the afterward. beautiful, touching photographs of children living in Chinese orphanages.